The NASDAQ Composite Index made a new all time high this week. That doesn’t sound like much when you realize that you have to go back to March of 2000 to find the previous high. Those 15 years in between hurt a lot of small investors (they now are at theoretical break even). Sure makes a case for active management, since no one (but no one) gives out “brownie points” for staying the course and just being patient. We have broken out of our trading range and Friday gave us a gap up with a small range bar. Those small ranges in price indicate that there is about as much selling as buying. Let’s not be surprised if we see (likely) a retrench of prices back down toward the 5020 area. What happens after that is important. If prices hold and slowly move higher, that’s great. If they hesitate, falter, trend lower and volume picks up, that’s bad. Market Sentiment has now improved from Neutral to Bullish. Money Flow is cautiously positive; all good signs. Corporate earnings are generally Good to OK with only a few surprises. What would be a negative is any issue with Greece and the reaction by the EU (European Union). That could be a significant set back for markets worldwide. Let’s hope not. In light of generally positive conditions, world markets are recovering from an oversold condition. That includes Europe, Latin America and most Emerging Market countries. Caution is still warranted but that is where the potential opportunity exists. I’m looking for strong high growth stocks both fundamentally and technically. 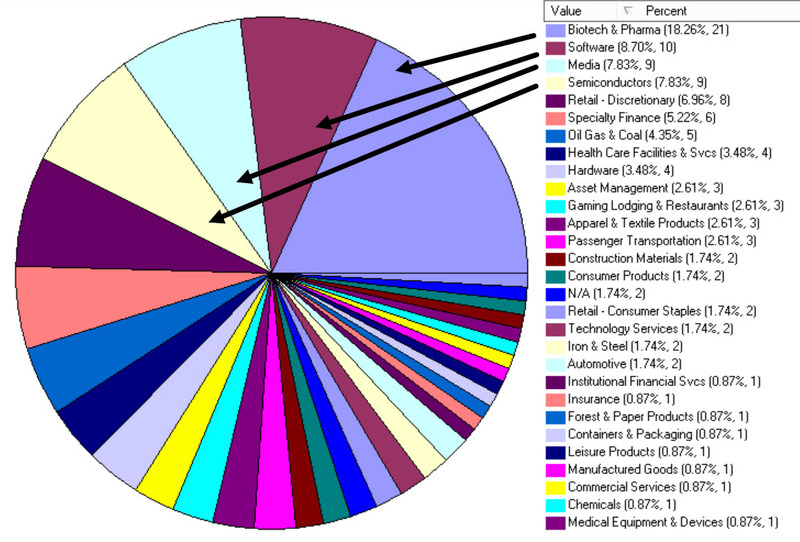 The pie chart below shows what industry sectors (I believe) those stocks are in. Let’s see if that buying pressure is continuing. 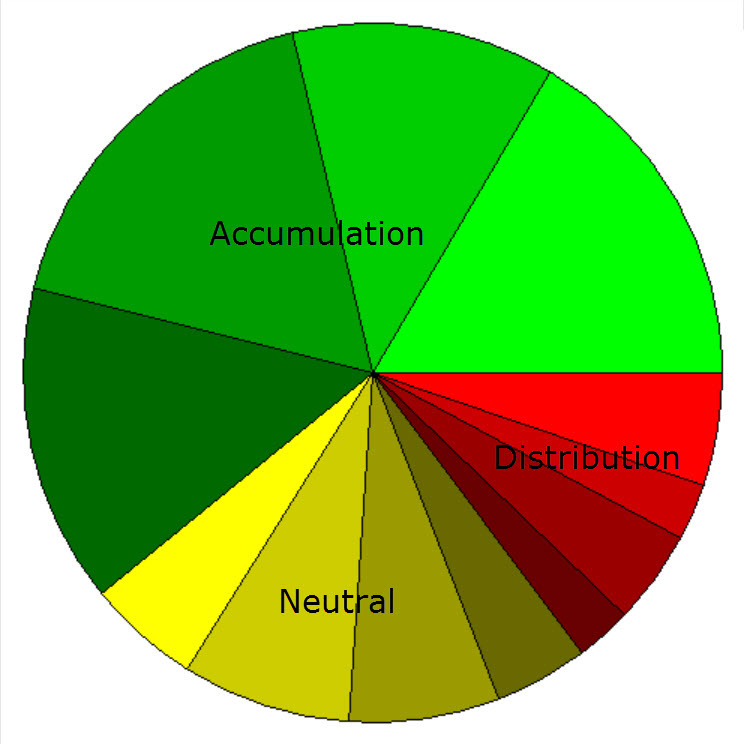 The chart below shows the Accumulation (buying) and Distribution (selling) in those same stocks. Buying is strongest, but I am starting to see a little more selling beginning to appear. Rotating out of one sector into the next “hot” one is a well known technique. My concern is let’s not fall in love with any stock, as it can (and will) go down faster than it went up. Remember: no brownie points for being “patient”! Have a good week and let’s watch for a retracement in this market. It may be a good point to add to positions or find new ones. …. Tom …..